Segmenting data in web analytics may be an old concept that has been in existence since the first free web analytics tools such as Google Analytics, Yahoo Analytics and Piwik PRO. However, it is not always obvious what it is all about. So, let’s shed some light on web analytics segmentation and what it can do for us. This can truly lead us down a road to enlightenment, which, in turn, will help you to make smart business decisions. Let’s dive in! Why use web analytics segmentation? No matter which web analytics tool your company uses, by default it will provide you with a lot of aggregated data. When you first log in to your tool, you will see the total number of visits to your site, average time on site, average bounce rate, average conversion rate, etc. It’s great to have all these numbers, but if you want to make informed and smart business decisions, you will need more data in context. If your decision process is based only on aggregated data, you will have to assume that your visitors consist of the same type of audience, i.e. that each person coming to your site has similar interests, behaves in the same manner and looks for the same content. Obviously, this assumption is not correct, as in general every user is different. You can, however, discern and identify various groups in the body of your website’s users – segments of visitors with similar qualities. Uncovering these segments and their properties holds the key to making the best of your web analytics data. There are two ways of using web analytics segmentation. You will most probably begin your adventure with predefined segmentation types that most web analytics tools come with by default. Users entering your site in search engines: this segment will help you to identify which content ranks high in search engines and drives the most traffic to your website. It will help you to assess whether your content is good enough to rank high in search engines, presents value to your visitors and welcomes engagement and conversion. As you may see, even predefined segments will help you to uncover more about your users and will bring you closer to better understanding of your visitors’ behaviour. 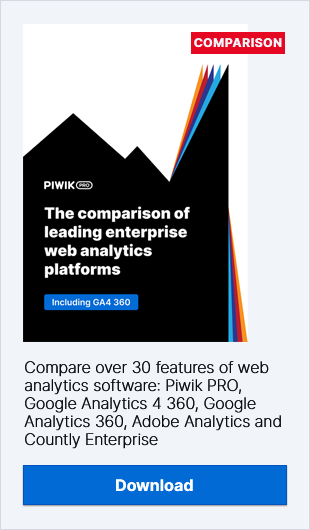 If you’d like to read some Piwik PRO segmentation use cases and check its abilities and customization process, refer to this blog post. Smart web analytics segmentation is easy! Predefined segmentation is a good starting point, so if you’ve never used segments, give it a go now. Once you get used to the default segments, you will surely crave more insights. However, there are certain guidelines that need to be followed as a rule of thumb. In one of our recent posts, we described how to choose proper KPIs (Key Performance Indicators) for your website. If you read it, you could already spot the possible benefits of using KPIs in relation with segmentation. To segment in a smart way, you should define your own segments reflecting your website’s KPIs. This way you will be able to segment users that help you to achieve your website’s goals. The more you know about their preferences and requirements, the easier it will get for you to attract even more visits from users that meet your KPIs’ goals. For instance, let’s say that your KPI is average order value and your goal for this KPI is $600. After segmenting your data, you could uncover that you had 50 users that met this criterion. It would be extremely valuable for you to know where these visitors came from, which content they were interested in and how they navigated through your website. Having this information at hand will get you closer to getting more users that meet your website’s goals. The real power of web analytics is only revealed if you use your data wisely. With web analytics making it easily accessible, almost anyone can track visits, bounce rates, the average time on site and numerous other metrics. Be smart and segment your visitors data – it will provide you with invaluable insights that will help your website and business thrive. For more information on segmentation in Piwik PRO be sure to check out our User Guide. In one of my future posts, I will share with you our ideas for user segmentation. In the meantime, maybe you would like to share your segmentation ideas?